A piano (also called a pianoforte) is a musical instrument classified as a percussion instrument that is played by pressing keys on a keyboard. Each key is a lever that makes a hammer inside the piano hit a string inside, producing a sound. Each string has a different length and so produces-a different note. The piano has been an extremely popular instrument in Western classical music since the late 18th century. A person who plays the piano is called a pianist. The piano was invented by Bartolomeo Cristoffori of Padua, Italy. He made his first piano in 1709. It developed from the clavichord which looks like a piano but the strings of a clavichord are hit by a small blade of metal called a “tangent”. In the piano the strings are hit by a block of wood called a hammer. The early keyboarded instruments, such as the clavichords, harpsichords and organs that were used at that time, had a much shorter keyboard than they do today. Gradually the keyboard became longer until it had the 88 notes (7 octaves plus three notes) of the modern piano. Although the piano was invented at the beginning of the 18th century, it was not until 50 years later that it started to become popular. The first time the piano was played in a public concert in London was in 1768 when it was played by Johann Christian Bach. The upright piano was invented in 1800 by John Isaac Hawkings. Seven years later T. Southwell invented “over-stringing”. This means that the strings for the low notes go diagonally across the soundboard so that they can be longer and make a much bigger sound. A piano has a keyboard with white keys and black keys. When a key is pressed down, the damper comes off the string and a hammer hits the string. It hits it very quickly and bounces off so that the string is free to vibrate and make a sound. When the player takes their finger off the key the damper falls back onto the string and the sound stops. The strings are stretched very tightly across the frame, passing over a bridge on the way. The bridge touches the soundboard. This means that the vibrations are sent to the soundboard. The soundboard is a very important part of the piano. If it is damaged the piano will not make a sound. At the bottom of every modern piano there are at least two pedals, which are levers that the pianist presses down with his or her feet to change the sound. Many pianos have three pedals, but a few have even more. Each pedal changes the sound in a different way. The three pedals of a piano. 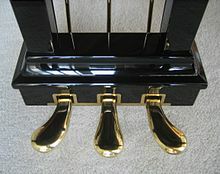 From left to right, they are the soft, sostenuto, and sustain (damper) pedals. The damper pedal (also called the sustain pedal) is the pedal on the right, and the one that is used most often. For this reason, it is often called just "the pedal". It is pressed with the pianist's right foot, and makes the dampers (which look a bit like the hammers) that usually rests on the strings come off, so the strings are free to vibrate. As long as the pianist holds this pedal down, the notes he plays will keep on sounding even when he takes his fingers off the keys. Some other strings will also vibrate very lightly (this is called “sympathetic vibration”), which makes the sound smoother and richer. Pianists have to learn how to use this pedal well. This will depend on such things as the style of the music, the size of the piano, the size and the acoustics of the room in which the instrument is in. The soft pedal (also called the una corda pedal) is the pedal on the left, and is pressed with the pianist's left foot. As its name suggests, this pedal makes the notes sound quieter. On a grand piano, the whole keyboard and action shifts a bit to the left so that the hammers only hit two strings instead of three. The soft pedal is usually used only in classical music and is normally kept down for the whole of a piece or a section of a piece. On pianos with three pedals, the pedal in the middle does different things on a grand and upright piano. On a grand piano, it is the sostenuto pedal, and is pressed with the pianist's left foot. Like the right pedal, it keeps the sound going, but only on the notes that are being played at the moment when the middle pedal is pressed down. This makes it possible to keep one chord going while playing other notes that will not carry on. All concert grand pianos have a sostenuto pedal, and some modern upright pianos do as well. The middle pedal on some upright pianos is not a sostenuto pedal at all, but a practice pedal. It places a piece of cloth in front of the strings, making the sound very quiet so that a pianist can practise without disturbing other people. The practice pedal can usually be pressed down and put in a slot so that it will stay in place. The damper pedal is the most important pedal, and so many composers often write down in a piece of music when the pianist should press and when he or she should let go of the damper pedal. In most classical music, there is a sign that says Ped. where the pedal should be pressed, and one that looks like an asterisk where the pedal should be let go. Pedal marks can also appear as a straight line under the staff. Often, the pianist will let go of the pedal and press it again right away; this is called changing pedal. Sometimes, the music will simply say con pedale, which in Italian means with pedal. It means that the damper pedal should be used, but the pianist should know when to change the pedal. Another sign, which tells a pianist to press the soft pedal is una corda, (Italian for one string). It is held down until another sign, tre corde (meaning three strings), appears, telling the pianist to let go of the soft pedal. In early pianos, it was possible to press the pedal a little way so that the hammers hit two strings, then press it further so that they hit only one string. There is no sign for the sostenuto pedal, so it is up to the pianist on whether to use it in a specific piece of music. Pianists who play popular music include Liberace, Jerry Lee Lewis, Little Richard, Elton John, Billy Joel, Thelonious Monk, Tori Amos and Ray Charles. Perhaps the greatest jazz pianist was Fats Waller. Wikimedia Commons has media related to Pianos. This page was last changed on 26 March 2019, at 17:44.